Being America’s first law school means that we are heirs to a rich tradition. 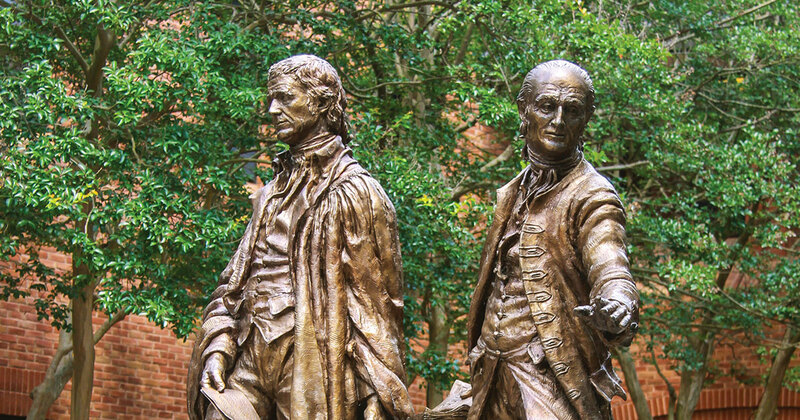 William & Mary Law School’s roots go back to 1779, when, in the middle of a political and social revolution, a chair in law was established at William & Mary to educate citizen lawyers for the new nation. George Wythe’s first class in 1780 fulfilled this promise; it included a future senator, a future chief justice of Virginia, and two future justices of the United States Supreme Court. As we celebrate our tradition, we have a responsibility to turn a critical eye to it, as well. Those first students, and their successors for the next 156 years, were all white and were all male. Many owned enslaved people and supported the institution of slavery through their legal practice. Today, however, our dedication to educating citizen lawyers embraces the idea that the legal profession benefits from the inclusion and understanding of diverse backgrounds. We therefore seek to reflect diversity in its many forms: race, ethnic background, gender, age, sexual orientation and identity, religion, disability, first-generation college students, military status, socioeconomic status, and intellectual diversity, among others. We also recognize that the true value of diversity cannot be measured exclusively in numbers; it must also include interactions, dialogues, and experiences shared every day between members of our community. We therefore actively seek to create opportunities for dialogue between people of different backgrounds and outlooks. We strive to build a community of citizen lawyers as diverse as the nation William & Mary Law School helped to found. The Law School’s admission policy embraces the view that both the educational process at the Law School and the legal profession are best served by an admission process that uses a holistic review process to select a diverse and talented student body. Our LL.M program in the American Legal System seeks to recruit and admit graduate students from a wide array of backgrounds and countries. Recent LL.M. students have come from Algeria, China, India, Malaysia, Mexico, Pakistan, Poland, and Saudi Arabia, among other countries. With a J.D. population of about 600 students and an LL.M. population of about 30 to 50, the Law School features an impressive number of student organizations whose missions reflect the diversity of the Law School population, including the American Constitution Society, the Asian Law Students Association, the Black Law Students Association, the Christian Legal Society, Equality Alliance, the Federalist Society, the Jewish Law Students Association, the J. Reuben Clark Law Society, the Latino Law Students Association, the Military and Veterans Law Society, and the Women’s Law Society. Our Office of Career Services (OCS) is committed to the professional success and development of all our students. Among its many other efforts, OCS promotes to our students the opportunity to participate in a variety of off-campus interview programs with a diversity focus as well as an extensive number of diversity-related fellowship and scholarship programs. Our Office of Development and Alumni Affairs continually seeks to engage diverse graduates of the Law School in the Law School’s activities, including through its Co-Counsel program, which pairs alumni with current students for advice and mentoring. Both the William & Mary Law School Alumni Association Board of Directors and the Marshall-Wythe School of Law Foundation Board feature a diverse membership. The Law School’s curriculum, programs, and special events address issues of importance to diverse communities. Courses such as Gender and Human Rights; Law of Domestic Violence; Law and Social Justice; Race, Law, and Lawyering in a Diverse Environment; Selected Topics in Race and American Legal History; The Wire: Crime, Law, and Policy; our student-edited Journal of Race, Gender, and Social Justice (which publishes scholarship by academics in the field); and programs such as Revive My Vote, Street Law, and our Center for Comparative Legal Studies and Post-Conflict Peacebuilding (which enables students to work for NGOs and similar organizations around the world) provide students with exposure to diverse perspectives and communities. Special events, such as the Black Law Students Association’s annual symposium on race and the law, bring nationally known experts from outside William & Mary to engage with our students. Our clinics, including our Special Education Advocacy Clinic, Puller Veterans Benefits Clinic, Elder and Disability Law Clinic, Domestic Violence Clinic, and Legal Aid Clinic, serve diverse populations in the community and help students understand and serve a variety of client backgrounds and needs. Our Puller Veterans Benefits Clinic, in particular, has been recognized as a model for law schools throughout the country and has expanded its outreach efforts to include Military Mondays, a partnership with Starbucks Corporation to provide advice and counsel to veterans in local Starbucks locations. William & Mary Law School welcomes your input on fostering a diverse and inclusive climate for all members of our community. You may use this confidential form to provide feedback or suggestions to the Dean's Advisory Committee on Diversity and Inclusion.